Schematics of the control board You can see it here. 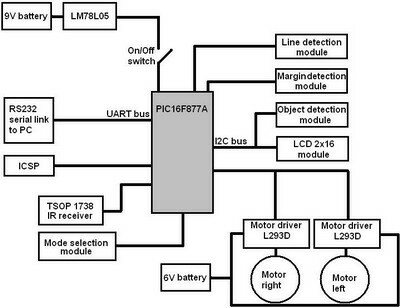 Schematics of the opponent detection sensor board You can see it here. 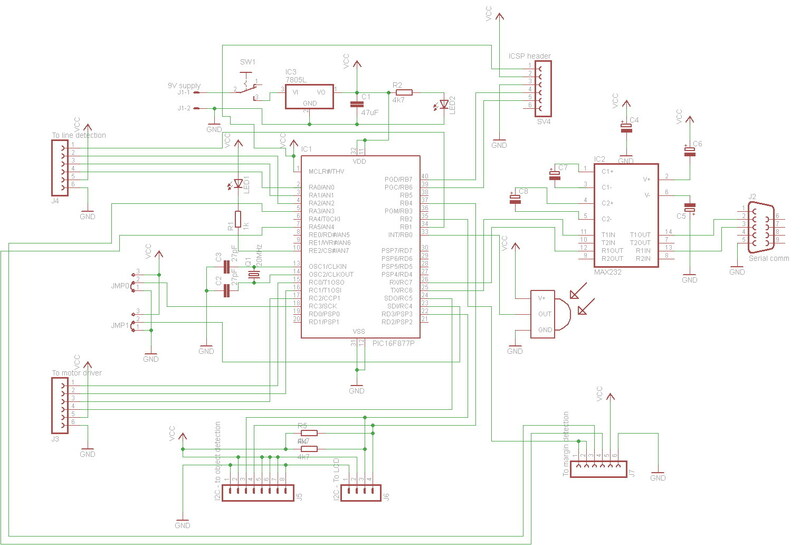 In the schematics thare's a mistake: pins 5 and 14 of PIC are wrong connected to Vcc and GND. 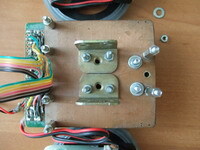 Opponent detection module, easy noticeable from front side, is based on 38kHz IR beam emission and reception. 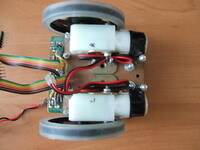 The module is controlled by a PIC16F88 microcontroller which communicates to main controller via I2C bus. 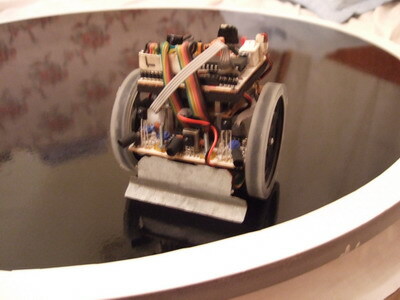 The front scoop has a concave shape on its down side in order to be able to face robots like this one. 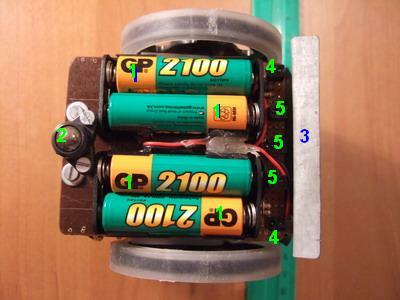 I put the batteries (all 5 are 180-220g in weight) and motors in a low position as possible in order to lowest to position of the center of gravity. The opponent detection periodically sends 5 modulated pulses with a duration of approx. 600us. Each pulse is followed by a 600us break. This is happening consecutively on all of the 4 emitting LEDs ( 3 in front side and 1 in the rear side). In the same time with the emission of these pulses, the reflections received by TSOP1738 are counted (using interrupts). If at least 3 reflections are counted, MR1 decides that there's an object in the direction of the corresponding emitter LED. 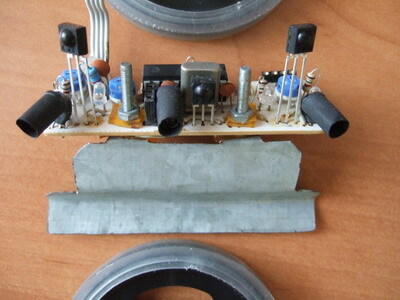 By construction, I surrounded each LED with a heat-sink dark tube, so it can't emit its beam directly in the direction of a TSOP receiver. In this way, ideally, the TSOPs "catch" only the reflections. The LCD with I2C interface is not a part of the robot, because it would make it heavier than 500g. It can be added for debug purposes. In this short movie, MR1 must push a white box with paint out of the ring. The box is weighing approx. 650g. In this short movie, MR1 must push a white box with paint out of the ring. The box is weighing approx. 1600g. In this short movie, MR1 is pushing out of the ring the photo camera. 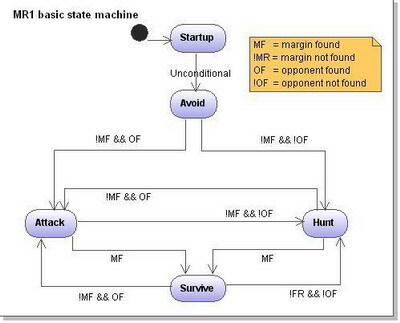 This is the functional mode with the highest priority. When MR1 receives a valid code from the remote TV control, it executes the associated command immediately, regardless what it was doing in that moment. MR1 enters this mode immediately after receiving any valid code and it exits the remote controlled mode only when the OFF key of the remote TV control is pressed. 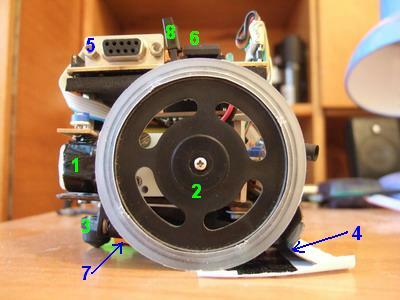 For example, it happens some times to make a major modification in the software and after “burning” the hex file, I see that the minisumo robot does not move anymore. 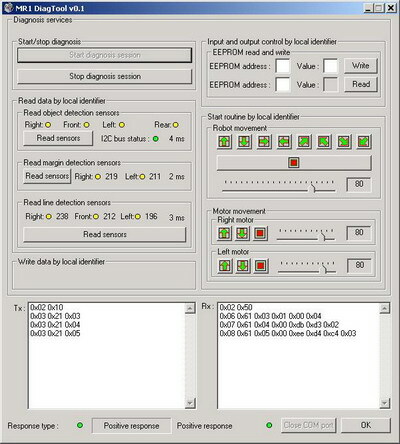 In such a situation, the first question is: “is any motor or sensor crashed or I have just another software bug?” This question can get a quick answer using the diagnosis! 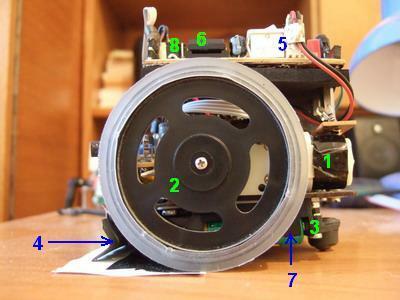 This is the mode in which the minisumo robot is the most part of the time. MR1 enters this mode immediately after switching on and every time it exits any of the previous modes. 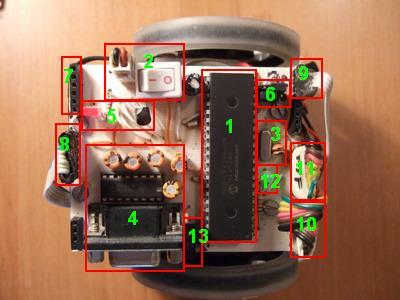 In this mode, the robot executes the program selected by the program selection jumpers. 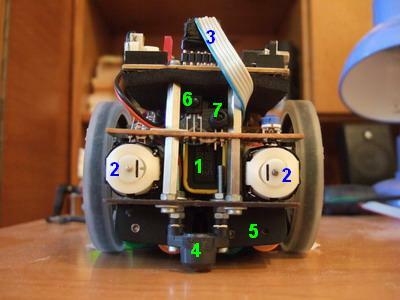 My minisumo robot can execute 4 different programs. These programs are selected via the program selection jumpers. The purpose of this program is to calibrate the tresholds between “black” and “white”, for the line and margin detection sensors. Also, it decides the duty cycle of the 38kHz beam emitted by the opponent detection sensor. But what’s happening “inside”? MR1 memorizes the values measured by ADC for each sensor and for each zone (white/black). 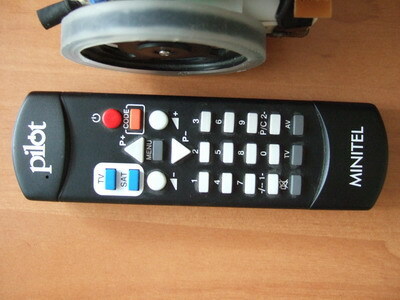 For each of the sensors, it computes an average value between the white zone value and black zone value and decides that this average is the treshold between black and white. Then writes all the tresholds in EEPROM. 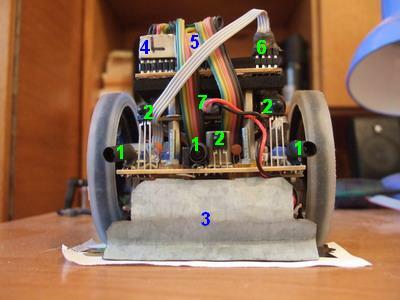 In this way, each sensor has its own treshold. 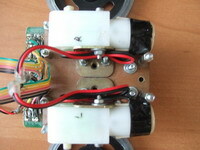 The opponent detection sensor is treated almost in the same manner. 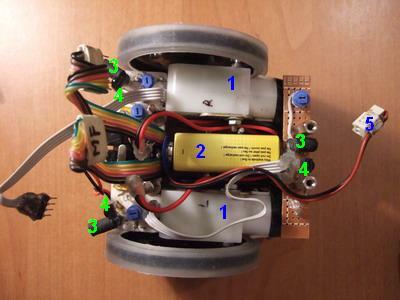 The duty cycle of the 38kHz beam is changed until the sensor “finds” the object put in front of the robot. The possible values for the duty cycle are 25%, 50% and 75%. 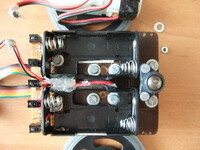 Once the correct duty cycle is found, it is stored in the EEPROM. 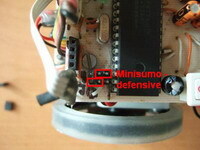 When executing this program, the minisumo robot has to detect the opponent and push it out of the ring. More, MR1 has to take care not to go outside of the ring by its own. The feature that makes the difference between this program and the minisumo offensive program is that MR1 performs a "slip away" manoeuvre immediately after the first 5 seconds elapsed. 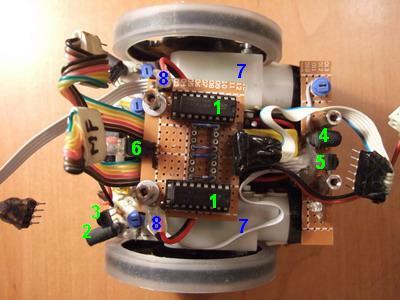 The goal is to avoid a very quick robot that could attack directly and immediately after the first 5 seconds. It’s almost the same as the minisumo defensive program, the only difference is that the slip away manoeuvre is not executed at all. When executng this program, MR1 has to follow the path created by a black line on a white floor. The width of the line must be at least 1.5 cm. 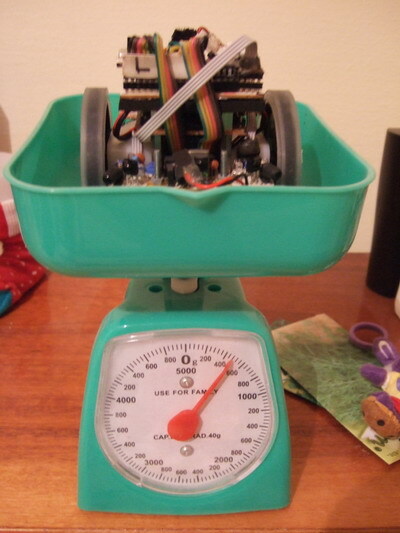 MR1 is a minisumo robot, line following functionality not being important, I don’t insist on this program ( and I didn’t when I wrote the software).